Portugal’s sunny Algarve region is home to some of the prettiest towns and beaches in Europe, so it’s no surprise that one of them appears on this list. Carvoeiro sits on the southern coast of Portugal, and its golden sand beaches are quite enough to draw us in - but it offers much more! The surrounding region boasts charming old towns, a variety of theme parks, and a plethora of hiking trails. Carvoeiro is easily reachable via Faro airport, and close enough to Lisbon that if you fancy extending your trip to do a little exploring of the rest of the country, you can pop over! The best time to visit for sunny skies is from March until November, so if you can go outside the school holidays for some off-season sun, you’re likely to find some bargains! Don’t miss the delicious custard tarts that the country is famous for - pasteis de nata - and do remember to take sun cream! 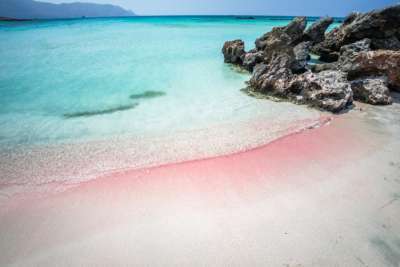 We couldn’t possibly leave Elafonisi beach off the list for one simple reason: the sand is pink! An Instagrammer’s dream, the powdery sand is a result of tiny ground up shells and the microbes their erstwhile inhabitants ate. The colour does depend on the season, as it’s an ongoing creation, but if you catch it at the right time you’ll see swathes of rosy sand stretching out as far as the eye can see. Elafonisi is actually an island: the sandbar that connects it to mainland Crete is submerged by about a metre of water at most, so visitors can wade out to the islet easily. The island itself is an internationally classified nature reserve, and you might get to see loggerhead turtles if you’re lucky! Insta friendly? Check. Adorable animals? Check. Gorgeously sunny weather from April until December? Check and check. For a tranquil break from the grey, gloomy weather, we’d pick Elafonisi! Returning to a slightly better-known holiday destination, Lake Garda sits in northern Italy and has crystalline waters, sandy beaches, and (most importantly) delicious Italian food. Who can resist a great pizza? Obviously, it’s a lake rather than the sea, but Garda boasts around 28 miles worth of beach, which is certainly not to be sniffed at! For some family fun, we’d recommend Spiaggia Tifu, which is in the gorgeous historic town of Limone sul Garda. Here you’ll find cobbled streets, gelaterias galore, and easy access to the lake. If you’re after something a little more secluded, check out the Bay of the Sirens, and for history buffs the Malcesine beach is a must see: on one side, there’s a medieval castle, and on the other, the soaring shape of Monte Baldo. 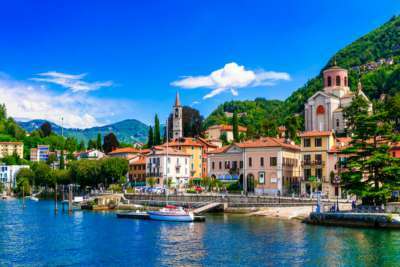 Lake Garda is easily reachable from both Milan and Verona, so choose one to fly into and perhaps spend a couple of days exploring your chosen city. Discover Milan’s famous duomo and fashion scene, or re-enact the balcony scene from Romeo and Juliet in Verona, before heading off to a beach break with a difference. Stretching out into the Celtic Sea, Ireland’s County Kerry proves just why the country is so often known as the Emerald Isle. 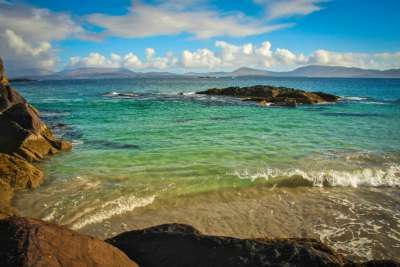 With soft white sand meeting glowing turquoise beaches, you’d be forgiven for thinking Caherdaniel beach was somewhere decidedly more exotic. Not so - just a quick hop across St George’s Channel from England will have you in the Republic of Ireland, and if you happen to live in the south west, you could even jump on a ferry and drive! Talk about convenience - and great for anyone who isn’t so keen on flying. Unfortunately, unlike its mainland counterparts on this list, Kerry doesn’t see balmy temperatures for half the year. If you’re after some warmth, head over in July, but if you just fancy the sea air and a stroll along a pretty beach, you can visit out of season too. If you’ve got the car, we recommend driving around the Ring of Kerry for some spectacular views, and Killarney National Park provides plenty of opportunity for a bit of hiking. Spain’s Costa Brava has become something of a magnet for holidaymakers, and it’s easy to see why. Shimmering blue seas meet gorgeous towns, and these are combined with a deliciously temperate climate and cuisine to die for. Calella de Palafrugell is no exception, and its postcard-perfect white houses contrast with the vibrant blue of the sea and sky exceptionally well. The best beaches in the area are found along the Camino de Ronda - a road originally used to protect against pirate attacks! Nowadays, it meanders its way along the Costa Brava, and you can traverse it on foot, on a bike, or even on a horse! We’d check out the gorgeous El Golfet beach, which is close to the botanical garden at Cap Roig - this is well worth visiting too, and is considered one of the best botanical gardens in the Mediterranean! If you thought we were done with colourful beaches after Elafonisi, think again: another of Greece’s islands boasts sand like you’ve never seen it before. 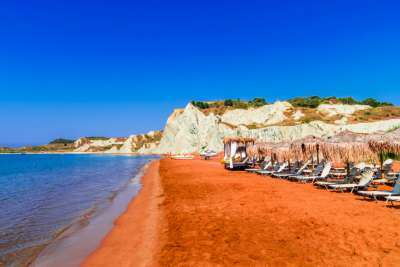 Xi Beach in Kefalonia is a vibrant, rusty orange colour, and is a great family-friendly pick thanks to its Blue Flag status. Kefalonia is one of the country’s best producers of feta, olive oil, and honey so if you’ve been craving a delightful salad, then we can’t think of anywhere better to go! It’s also a hotbed for vineries, so find yourself a local taverna and ask to try the local speciality - we reckon you'll be impressed! Straying a little further off the beaten track, Montenegro’s unsung beaches are a fantastic place to escape to for a budget break. It’s just down the coast from Croatia, and few people make the journey down the shoreline to check out this other pearl of the Adriatic. Montenegro is quieter than its more popular neighbour, but boasts just as many lovely beaches to relax on, so if you’re after some easy summer sunshine, get booking! 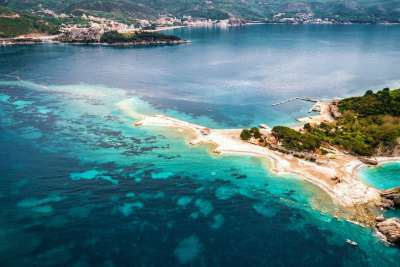 The ‘Budva Riviera’ covers about 22 miles and offers a range of both pebble and sandy beaches. For a real oasis, catch a taxi-boat from the seafront in Budva and head to Sveti Nikola - an island known by locals as Hawaii! Here, you’ll find fragrant pine forests, secluded stretches of sand, and a delicious restaurant where you can stop for lunch. Sounds pretty heavenly to us! And you thought you had to leave the UK to find spectacular beaches. 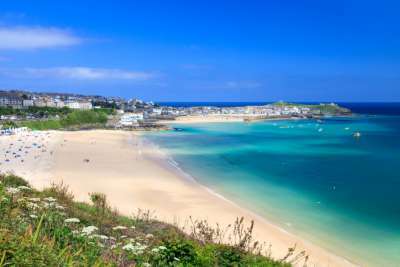 Not so - Cornwall’s St Ives has transformed from a quiet fishing village to one of the most popular seaside destinations in the UK. In fact, it has been named one of Europe’s top beach destinations! If you’ve ever been down to Cornwall, you’ll know why: our sea might not be the warmest, but brave it in the height of summer (maybe with the help of a wetsuit… or two!) and you’ll be treated to gentle waves that make it popular with beginner surfers, as well as bodyboarders. Back on land, the town itself boasts the Tate St Ives, which exhibits a host of modern British artists who have links to the St Ives area. It’s a great place to pick if you feel like remembering what’s really, truly delightful about this rainy country of ours. And if you fancy stopping for a tea break, you can even try the famous Cornish clotted cream - just make sure you put the jam on the scone first! Perched in the Zadar archipelago in Croatia, Saharun beach is another one that’s almost too pretty to be real. The sea glitters off the glowing white pebbles of the beach, and you can wade out an impressively long way, which makes it great for those with little ones. Even the ferry journey over from Zadar is gorgeous: you’ll sail through islands that are covered in deep green pine forests, and as you breathe in the ocean air you’ll feel all your worries melt away. Zadar itself is lovely, boasting Roman ruins and churches to visit before hopping on the boat. The island is called Dugi Otok, and while it seems to be little known to visitors today, there are the remains of a first century Roman villa along the coast, which proves that the Romans knew about the island, and potentially used it as a holiday destination! If you’re after some island exploration, head over to the Veli Rat lighthouse, which you can climb for awe-inspiring views over the Adriatic. You didn’t think we could finish this list without Halkidiki, did you? Greece boasts some of the best beaches in the world (it has over 2000 islands to choose from, after all!) and Halkidiki is perhaps one of the best known. Halkidiki isn’t an island, though - it’s attached to mainland Greece, but has three peninsulas that reach out into the Aegean Sea and boasts a whopping 62 beaches to choose from! We couldn’t pick just one, because they’re all so beautiful, but think white sand, shimmering blue water, and a variety of activities! Sani beach is great for a party, and offers the best sunset in the area, so make sure you have your camera at the ready! Some are geared towards partying, some boast parasols and loungers, and some are secluded and quiet. Get researching to figure out which beach(es) you’d like to see on your next trip!